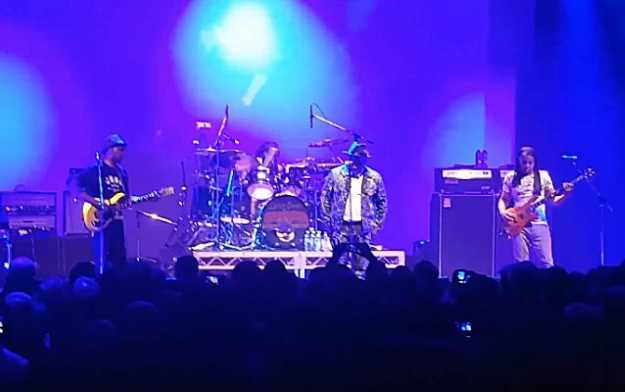 LIVING COLOUR paid tribute to Chris Cornell by performing the SOUNDGARDEN song "Blow Up The Outside World" on May 19 at the final show of the group's New Zealand/Australia tour at Astor Theatre in Perth. Singer Corey Glover, guitarist Vernon Reid, bassist Doug Wimbish and drummer Will Calhoun played an emotional cover of the 1996 "Down On The Upside" number, welcoming fans to join in during the song's chorus. Reid had always been a huge fan of SOUNDGARDEN, and LIVING COLOUR had previously performed "Blow Up The Outside World" throughout 2001-2003 after the track was banned from radio play after the World Trade Center terrorist attacks. Cornell apparently committed suicide by hanging on Wednesday night - May 18 - after SOUNDGARDEN played a show in Detroit. He was 52 years old. In the days since Cornell's tragic death, a number of artists have paid tribute by covering his songs, including MEGADETH, DREAM THEATER, QUEENSRŸCHE, STONE SOUR, LIVE, THE PRETTY RECKLESS and HEART's Ann Wilson, while LINKIN PARK dedicated their appearance on "Jimmy Kimmel Live!" to him. While the surviving members of SOUNDGARDEN have not yet issued a public statement about Cornell, drummer Matt Cameron posted a brief message on Facebook, saying, "My dark knight is gone… Thank you for the incredible outpouring of kindness and love." LIVING COLOUR's sixth studio album, "Shade", will be released on September 8 via Megaforce Records. The follow-up to 2009's "The Chair In The Doorway" was recorded with producer Andre Betts.